Hi, I’m Nick. I’m a new Developer Evangelist here at SendGrid. I’m excited to help developers build great things and be creative. When I explain the value of SendGrid to developers, they get it. After getting the job, I found myself explaining SendGrid to non-developers, like friends and family. Notably, one of my toughest early audiences were two people I’ve known all my life. I thought I’d share the conversation I had with my mom and dad, so no one else needs to explain that SendGrid isn’t, in fact, a company that distributes graph paper. What’s this company that you hired you? SendGrid makes it really easy for programmers to make applications that send email. In fact, we’ve made it so easy that we send over six billion emails a month! So you’re the people who send me all that junk mail? But wait! I thought you said SendGrid was for applications, not websites. When I said applications, I didn’t just mean the ones on your phone. I’d include web apps, like Pinterest and phone apps like Spotify and Foursquare. 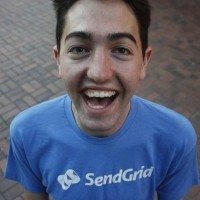 So how does the application tell SendGrid to send an email? Apps talk to SendGrid using what’s called an API. APIs are just ways for computers to talk to each other. SendGrid talks with apps using a number of APIs that we make available to developers. But I send emails every day, why would anyone pay a company to send email? Well, it turns out when you start sending lots of emails it becomes really hard to do. Computers get overwhelmed, email providers (like Gmail) can start marking your messages as a spam automatically, and it’s hard to tell if people even receive, much less read your email. SendGrid makes all that really easy, so there are lots of reasons people would want to pay SendGrid, rather than spending thousands to send email themselves. Well if it’s saving people lots of money, can I pay SendGrid? Well, um, I guess, but Mom, you don’t really write software. I don’t think you’re the ideal use case. But if you absolutely insist, you can go to http://sendgrid.com/pricing. You can follow both my mom and dad on Twitter, where they complain about me writing about them on the internet.